I almost didn’t go to the Disney animation preview at the San Diego Comic-Con. It was in Hall H, and anything in Hall H is there because thousands of people are going to show up. I didn’t wanted to wait in line for eons; I didn’t want to get trampled; I didn’t want to be let into the room when the event was halfway over. But I decided to try my chances, and while thousands of folks did indeed show up, getting in wasn’t too hard. And the wait to see glimpses of Disney’s Bolt and Pixar’s Up was worth it. Until now, I didn’t know much about Bolt other than that it had originally been Chris Sanders’ American Dog, until Disney Animation management (ie, John Lassiter and Ed Catmull) replaced Sanders with Chris Williams and Byron Howard. Nobody likes to see an artist’s baby taken away from him, and Sanders’ Lilo and Stitch was easily the best cartoon that Disney released during its pre-Lassiter decline and fall. I also saw the trailer tacked onto the front of Wall-E, which showed that Sanders’ quirky vision left the film when he did. So my instinct was to be wary. Williams and Howard showed about twenty minutes of Bolt in rough form–a surprisingly substantial percentage of the movie. And it looked…potentially okay. Disney is in such a period of rebuilding that I sometimes almost forget it makes animated features other than the Pixar ones. (Chicken Little was hyperactive and disposable; Meet the Robinsons couldn’t overcome the liability of being based on a book without a plot.) Bolt looks like it may at the very least be a step forward, even if it’s clearly a decidedly Disneyesque mass-market film rather than an oddball departure. 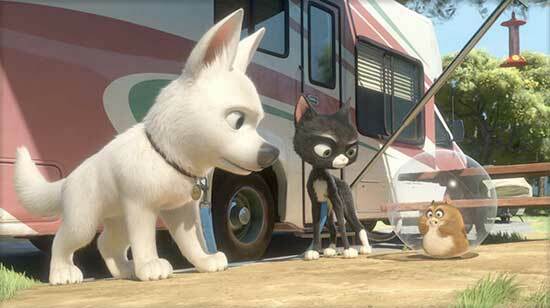 Bolt is about a dog who stars in a TV show in which he has superpowers, and the first chunk of the film we saw was a long scene from his show, rife with stunts, explosions, and cars driving off of things. It was nicely staged, but lacking in soul, but I’m hoping that’s kind of the point, since the story’s springboard involves Bolt thinking he really is a superhero, and having trouble adjusting to life in the real world. It also felt overly long. We’ll see. The second chunk we saw involved Bolt’s real-world adventures. They involved some Disney/modern animation cliches–a cute-but-manic sidekick, a crisis of confidence on the part of the hero, etc.–but I liked the surprisingly low-key feel. (John Travolta as a dog sounds like stunt casting, but it works.) And I laughed more than once. So I’m hopeful. Williams and Howard talked about the film using new technology to provide a look that’s painterly rather than photorealistic. I love the idea–I’ve brooded about computer animation’s fixation on photorealism for years–but the clips we saw didn’t look dramatically different from other recent CGI films. (In one scene, you can see every one of Bolt’s hairs, all beautifully rendered; I don’t know if I’ve ever seen one of Pluto’s hairs.) I’m hoping the finished product will show more of the painterly look. After the Bolt preview, Pete Docter talked about Up and shared a clip–the first time one’s been shown in public. We learned that the movie stars a 78-year-old man (voiced by Ed Asner!) who attaches balloons to his little house and takes flight to a spectacularly exotic part of Venezuela, with a stowaway boy scout in tow. They have adventures there, although Docter didn’t talk much about the nature of those adventures. Everyone’s comparing Up to a Miyazaki film–granted, without knowing all that much about it–and Docter seemed pleased by the comparison. I like the fact that the movie stars a cranky human senior citizen; I like the look of what we saw; I think that if nothing else, people who thought that Wall-E‘s robots represented a backwards step for the ambition of Pixar’s character animation may be relieved. (The image above is from the film’s online teaser, not from the movie itself.) I can’t imagine any major studio other than Pixar deciding to do Up–including the rest of Disney. 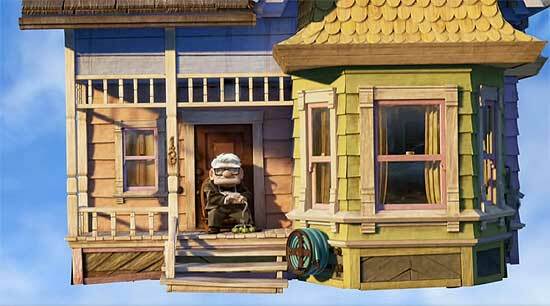 I liked the look of what we saw of Up; it wasn’t the least bit photorealistic. On the other hand, it may not have been fully rendered, either, and the opportunities for hyper-realism probably lie in the Venezuelan scenes, not the brief snippet we saw. These days, I don’t get out to new animated features unless my heart is in it–for instance, I haven’t seen Kung Fu Panda yet. It’s no surprise that I was already assuming that Up would be worth the effort, but I now know that I’ll see Bolt, too. That’s something. And hey, does anyone know what Chris Sanders is working on at the moment? Chris Sanders has bolted to Venezuela in a big, multi-colored balloon with his pet dog Whitey, hoping to fulfill his lifelong goal of creating his own “field of dreams” by planting the one green seedling he has left after having been butchered and leveled by his former place of employment, & therefore left penniless, and also after having become hopeless since his wife left him. He was last known, as rumored through the reliable source known as the “internet”, to be struggling to learn Maya as a hobby. We sincerely hope Chris does not give Up on these dreams. I’m not 100% on this, but I think I remember hearing somewhere that Sanders is working for Dreamworks now. Tissa, Don’t be tacky! If you’re not 100% certain, then you are part of the great Uncertain Internet Confusion And Disinformation Confederacy. That does NOT help. Be certain, make a call, drive over there and ask Chris out for coffee, or else go take a nap & confuse-us-not, please. Besides OUR sources (the “internet”) actually believe he IS in South America, as clarified above… (clue: this notation is on the “internet”). Where has everyone been-under a rock(don’t answer that)? I love Bolt it’s such a cool and sweat dog!! !